(sportsgambling.about.com) – In golf betting, there are generally three types of different bet types a gambler can make for any given golf tournament. 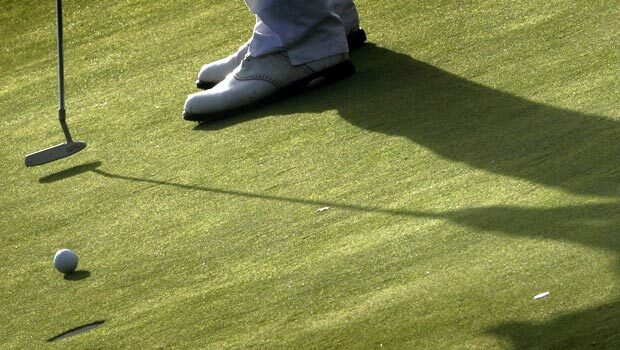 Bettors can wager on a particular golfer to win the event, wager that a golfer will place in the top three, or bet that a particular golfer finishes higher than another golfer. These odds are essentially listed as money line odds, meaning for every $10 you wager on Tiger Woods you would win $15 if he wins the race. Those wagering on Overton would win $70 for every $10 bet. Since your wager is returned to you on a winning bet, those wagering $10 on Overton would receive $80 back from a sportsbook and not $70, as sportsbooks require you to pay for your wager at the time it is made. Many tournaments will include a betting entry called “Field,” which consists of all other golfers besides the ones listed by the sportsbook. Even though a bettor gets more than one golfer with one wager, the field almost always consists of those golfers given the least opportunity to win and is usually best avoided. The odds will naturally be lower when betting on a golfer to finish in the top three, as the sportsbook must pay off three different winning bets, as opposed to just one. In this case, a bettor would have to risk $16 to win $10 that Tiger Woods will finish first, second, or third, while the bettor wagering on Jeff Overton stands to win $20 on their $10 wager, instead of $70. The last commonly placed bet in golf is head-to-head finish between two players. Here, a bettor doesn’t really care what place the golfer finishes in, as long as the golfer wagered on finishes higher than the other golfer. In this example, bettors wagering on Woods to finish higher than Stricker will be asked to risk $19 to win $10, while bettors believing that Stricker will finish higher than Woods will put up $10 to win $15. If you have bet other sports it will not be hard to catch on to how to be golf. One of the keys to betting on golf is finding the best line. Many sportsbooks have different lines on different golfers or many different ways to wager on an event. Looking for the most options and the best odds will reward the bettor in the end. The Masters is going to get extensive coverage so if you plan on betting on the golf this may be the best time to give it a try.